We are beings of habit, though. Our brains are wired to develop patterns of behavior, so that we’re not constantly making decisions. It uses less energy and frees up our mental resources. So when I’m traveling for extended periods of time, I begin to miss the structured days, the habits, the rituals. I do take some of these with me on the road, just to make my life a little bit easier. For instance, I usually travel with protein powder and oatmeal, so that I can have a consistent meal to start off the day. It gives me a bit of respite – being able to wake up and not having to worry about what I’m going to eat for breakfast. Get centered into the day before I have to start make decisions. Then, after that – I take the day as it comes. I also take a kettlebell around with me when I’m able. (Which usually means whenever I’m not traveling by plane.) Yes, I even carried one along for the 8,000 mile motorcycle trek that I took earlier this year. It was 25lbs of extra weight, but then I was also packing my podcast equipment – so I wasn’t traveling light. What I love about the kettlebell is that it’s versitile and allows me to keep fit when I’m on the road. Sure, there are a lot of body-weight exercises I could do, but just having that weight there with me is an extra bit of motivation. I can’t ignore it. Hell, if I’m going to lug it around, I *have* to put it to use. While I’m traveling – that’s about all the ritual that I take with me. When I get home, though, I have deeper morning rituals that help me get the most out of the day. When I first get up, I take care of meditation, gratitude and meals. Meditation and gratitude are part of centering myself and taking a moment to recognize the things I should be grateful for. For meditation I’ve been testing out Headspace (an app) and for gratitude I’ve used the 5-minute Journal for over a year. After that I prepare my meals for the day (unless I’m going out). Admittedly, I’m a utilitarian eater – so I just don’t want to have to worry about those decisions when I’m hungry. I’ve also found that taking care of it at once means that I eat healthier, rather than just grabbing whatever is available. I’ve been trying out a new framework for productivity and happiness each day. The morning ritual is a part, but only the first step. I’m going to stick with it for a few more weeks to see how it works out. If I find it useful, I’ll share. So, out of curiosity, what morning rituals do you have? I’m troubled by the same issue: how to keep habits while travelling? I managed to develop my own morning meditation/gratitude ritual, that I can practice anywhere, even if I’m backpacking in an hostel. As soon as I wake up, I just sit cross-legged at the top of the bed, and do a mix of 15 minutes of mindfulness / gratitude meditation. For other habits, such as running, I only manage to keep them if I stay in a place for at least a month. I’ve recently started to wonder if it even makes sense to try to develop habits while travelling, because the cost in term of energy of re-setting them up in every new location may be more than the temporary benefit. Maybe adopting a more flexible approach to habits would work better. For instance, I try to do physical activity anytime I can, and I make sure it’s pleasurable, so I don’t need the automation of a habit to be pulled to do it. hi chris, thanks for using that pic. That’s my dad starting off his day. I took this pic some fifteen years back. And i had almost forgotten about this pic. Dad is no more now. He passed away five years back. But this pic brought back those golden memories. It was a pleasure watching him going about his shave. He always chose the same place near the window facing the east and used the same wicker stool to sit on . He would then place the mirror , a cup of hot water, a box containing shaving lotion, brush, soap and alum block.And he would sit there bathed in the golden light of the morning sun. He would then put lather on his face and slowly with gentle care shaved off the two day long stubble. And after checking the smoothness with the back of his palm and asking my mom or us kids if his mustache were well balanced and had equal length on both sides he would apply alum block . It was like a religious ceremony. 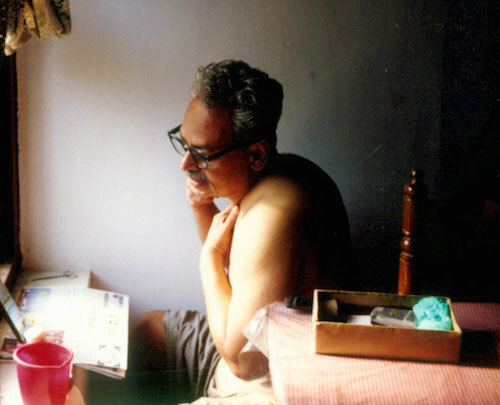 But then he did almost everything like that, whether watering plants or reading dailies or books. I think he found some sort of zen happiness while going through the details. Thanks for posting it chris.